The trophy also has a plate honoring Villwock’s 2007 Championship and plates for Steve David’s wins in five of the last seven seasons. Beginning with this year’s banquet, the trophy will be presented each year to the driver’s champion just as the Martini and Rossi trophy goes to the winning team. 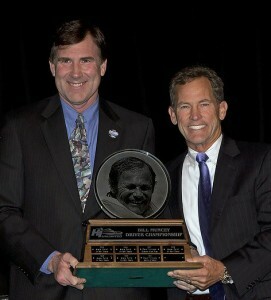 The new trophy was designed by Athletic Awards of Seattle. In the long history of Unlimited hydroplane racing, no individual defined the sport more convincingly than William Edward Muncey. From 1955 until his death at Acapulco in 1981, Bill was the unchallenged superstar. Muncey was an obscure 225 Cubic Inch Class pilot in the Mid-West during the late 1940s. In 1950, he had a chance to drive Albin Fallon’s MISS GREAT LAKES in the Harmsworth trials on the Detroit River. He was trying out for one of three spots on the U.S. Defense Team. The 21-year-old Muncey failed to make the final “cut” but he was still able to pull an incredible 97 miles per hour out of the obsolete MISS GREAT LAKES on a 5-nautical mile course. This was nothing short of amazing. Bill reportedly had to be coached on the fine points of starting the huge Allison engine. But once out on the race course, there could be no doubt that a major new talent had arrived on the Unlimited scene. Ted Jones was attending the same race with the SLO-MO-SHUN IV team. He happened to observe and was impressed by Muncey’s performance in the MISS GREAT LAKES. A few years later, when Jones was putting the MISS THRIFTWAY team together for Willard Rhodes, Ted remembered Bill and offered him the driver’s job. Muncey had some great years between 1955 and 1963 with MISS THRIFTWAY (also known as MISS CENTURY 21), winning four APBA Gold Cups and three National Championships. But he experienced some lean years in the middle and late 1960s with Shirley Mendelson’s NOTRE DAME and George Simon’s MISS U.S. when race victories were few and far between. It is a testament to the man’s character that he was able to rebound from those “off” years. He became his own owner in 1976, after a quarter century of driving for others. In partnership with crew chief Jim Lucero, Bill went on to achieve another Muncey golden age. He won 24 out of 34 races entered between 1976 and 1979 under the aegis of ATLAS VAN LINES. Bill’s first five seasons with MISS THRIFTWAY were characterized by sometimes brilliant–but often erratic–driving and by two major accidents: the first at Madison, Indiana, in 1957 and the other at Seattle, Washington, in 1958. His boat disintegrated at Madison and struck a U.S. Coast Guard patrol craft at Seattle. When rescue personnel reached him after the Seattle crash, Bill was officially dead at the scene when no pulse could initially be found. In the 1950s, Muncey always seemed to have his act together at the Gold Cup, which he won in 1956 and 1957 and finished second in 1955 and 1959. But his Gold Cups aside, Bill’s record was very mediocre. Arch-rival Jack Regas of HAWAII KAI III fame was the top driver of the decade and had a much higher winning percentage (45%) with nine victories in twenty races between 1954 and 1959. In fact, Muncey won only two non-Gold Cup races during the entire decade of the fifties. And one of those, the 1958 Detroit Memorial Regatta, was a fluke on account of MISS U.S. I conking out and GALE VI jumping the gun. The 1959 campaign was especially frustrating for Bill, who accounted for no victories and a lot of heats where he failed to finish. Starting in 1960, his consistency of performance improved considerably. He began winning a lot of races with the third--and most successful--MISS THRIFTWAY. Bill was National High Point Champion in 1960, 1961, and 1962, and won the Gold Cup in 1961 and 1962. He also set a world mile straightaway record of 192.001 in 1960 that stood for two years. Between 1959 and 1963, Muncey started in 85 heats with the third MISS THRIFTWAY and finished 77 of them. He was first 46 times, second 16 times, third seven times, fourth five times, fifth three times, averaged 54 heats at better than 100 miles per hour, and won 14 out of 32 races entered. He won those races against one of the most competitive fields in Unlimited history, which included Ron Musson in MISS BARDAHL, Bill Cantrell in GALE V, Don Wilson in MISS U.S. I, Rex Manchester in MISS SPOKANE, Mira Slovak in WAHOO, and Chuck Thompson in TAHOE MISS. Between 1960 and 1962, he finished a record 55 consecutive heats in a row. [at Seattle] setting a record of 112.500 mph, then went dead in the second, requiring a tow to the pits. “Those decrying this ‘humbled finish for a proud champion’ are not boat racers. Racers accept the good breaks with the bad. They recognize that winning may be the goal of racing but competing is its major function. To be sure, Bill Muncey would some day again rule the Unlimited world. But for the moment, he was an unemployed hydroplane driver with an uncertain future, although his credentials were second to none. Since landing his first Unlimited ride in 1950, Muncey had achieved the status of a winner. He would remain so, throughout the rich years--as well as the lean years--that were to follow. His tenure with the rough-riding NOTRE DAME ended midway through the 1964 season after a falling out with the crew chief Bud Meldrum. Bill nevertheless scored an upset victory over the National Champion MISS BARDAHL at Guntersville, Alabama, with NOTRE DAME. The MISS U.S. experience from 1965 to 1969 likewise proved unsatisfactory with only three victories in five years. According to Muncey, "Simon wouldn't give me enough money for the boat. Then he would turn right around and spend untold thosands, flying in relatives to the races from all over the country." No one was more affected by the events of June 19, 1966, "Black Sunday," than Bill Muncey. That's when three of racing's finest were lost in two separate accidents at the President's Cup Regatta on the Potomac River in Washington, D.C. They were Ron Musson of MISS BARDAHL, Rex Manchester of NOTRE DAME, and Don Wilson of MISS BUDWEISER. All three had been close friends of Bill Muncey. It was Bill who had recommended that Musson be hired to drive for Ole Bardahl in 1961. Wilson had been Muncey’s roommate in college. In the dark days that followed “Black Sunday,” Bill pondered the possibility of retirement from racing. His oldest son, Wil Muncey, Jr., who was 13 at the time, remembers those days vividly: “He realized that to quit now would be like cutting slack when he was needed most. Quitting would have meant debasing the sport that his friends had died enjoying, promoting, supporting, and participating in. He was compelled to make a contribution and to help keep things rolling. Bill decided to stay with it. But for the rest of his life, not a week would go by that he wouldn’t recall the sad memory of his three friends lost on the Potomac. Muncey finally got his career back on track in 1970 when he went to work for his old friend Lee Schoenith of Gale Enterprises. Bill’s best season of racing was arguably the 1972 campaign when he won six out of seven races for Schoenith, sponsored by ATLAS VAN LINES. Muncey won his long-awaited fifth Gold Cup and only broke one Rolls-Royce Merlin engine all year–and even then, he managed to finish the heat in second-place! The Gold Cup is the Crown Jewel of APBA racing. It's the one prize that every competitor wants to win at least once. Bill won the race eight times (1956-57-61-62-72-77-78-79). This eclipsed the previous record of five victories, set by Gar Wood between 1917 and 1921. In all, Muncey won 62 races in the Unlimited Class. The first was at Detroit in 1956 with the original MISS THRIFTWAY; the last was at Evansville, Indiana, in 1981 with the "Blue Blaster" ATLAS VAN LINES. In the post-World War II era, the only driver with more wins than Bill is Dave Villwock who has 65 victories between 1992 and 2011. How many Unlimited drivers who won races in the 1950s were still winning races in the 1980s? Only Muncey. Bill reached the end of the Thunderboat trail on October 18, 1981, on Laguna de Coyucca in Mexico. The victim of a "blow-over," Muncey lost his life while maintaining his familiar first-place. The team that he founded in 1976 continued in racing for another seven years under the leadership of Fran Muncey, Bill’s widow. Fran hired Bill's hand-picked successor--Chip Hanauer--to replace her late husband in the cockpit. Bill had always told Fran, "If anything ever happens to me, be sure to get the boat to the next race and put a driver in it." Hanauer picked up right where Bill had left off. Between 1982 and 1988, he won 24 races for the Bill Muncey Industries team, including an incredible seven consecutive Gold Cups. It is interesting to speculate as to what kind of a post-Acapulco career Bill might have had. He most certainly would have continued as a boat owner and as the sport’s most eloquent ambassador of good will. It is questionable whether Bill would have continued as a driver. At the time of his death, he was just a few weeks shy of his 53rd birthday. Bill Muncey’s legacy to the sport is a standard of excellence that will be difficult to surpass. And it’s possible, in the mind’s eye, to visualize Bill standing up there on the clouds, wearing that cowboy hat and those white-with-blue-trim coveralls, looking down on “his” sport. Reprinted from LEGENDS OF THUNDER. Copyright (c) 2009 by Fred Farley & Ron Harsin.